Looking for new ways to keep the kids entertained, with safe and fun outdoor play? 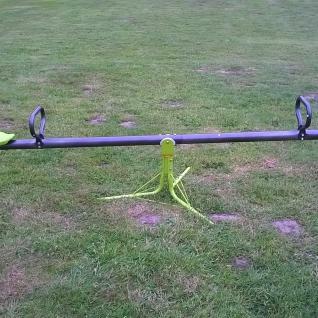 Look no further - this seesaw by Alice's Garden is just the answer! Seesaws are a favourite among children. They will actually feel like they are flying, with every rise and fall of the seesaw. The Boune seesaw also spins 360°. New sensations and fun guaranteed! This seesaw is perfect for families and outdoor play. The frame is coated in epoxy paint, which limits rust formation, along with galvanised steel hardware, to help you make the most of your set. The injection-moulded plastic seats are incredibly sturdy and are rot resistant by nature. The base of the seesaw has three feet to guarantee stability. Pegs are provided in order to anchor the seesaw into the ground. It comes delivered in a self-assembly kit with instructions in French.